Radioactive Helium is produced as Uranium-238 decays. The increase in Helium in the Atmosphere in consistency with the amount of uranium in the earth’s crust which reflects the earth’s upper age limit, and could not be more than an absolute max of 1.76 Million Years old. Helium is a byproduct of the radioactive decay of uranium-238. As uranium decays, the helium produced escapes from the earth’s surface and accumulates in the atmosphere, and as time passes, the amount of helium in the atmosphere continues to increase. Scientists have estimated the amount of uranium in the earth’s crustal rocks. From this they estimate the amount of helium that should be produced, and calculate how much helium is being added to the atmosphere over a given amount of time. Scientists also know how much helium is currently in the atmosphere. The calculations indicate an upper limit for the age of the earth’s atmosphere, at 1.76 million years. Robert Gentry, Geologist, decades ago analyzed zirconium silicate crystals (Zircon) that where recovered from hot Precambrian rock in New Mexico (dated by geologists to be over 545 million years old according to the geologic timescale). 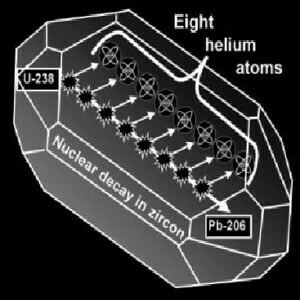 Enough of the uranium (radioactive) in the zircons had decayed to lead to give a radioisotope age of 1.5 billion” years, but Gentry found that up to 58% of the helium that the nuclear decay would deposit in the zircons was still in the crystals. This was very surprising; because helium diffuses (leaks) rapidly out of most minerals. 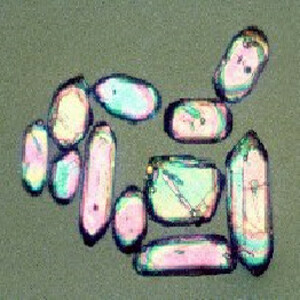 Shows some of the zircons he analyzed, between 50 and 75 microns (millionths of a meter) long. Not knowing how fast helium leaks from zircon, Dr. Humphrey from Institute of Creation research estimated what the leak rates would be when they were measured. In essence, the time estimate was determined by dividing the amount of helium lost from the crystal, by the time during which it had been lost. Each model (both old earth and young earth) was used to produce a graph to determine the results. The “1.5 billion year” model has rates over 100,000 times slower than the “6,000 year” model, because the former has to retain the helium for a much longer time. In the year 2000, the RATE group from Institute of Creation Research (ICR) had determined the estimates as numerical predictions for those two models. Figure 3 shows the predictions as red and magenta diamond symbols. The bottom axis shows the temperature (in °C) of each sample in situ, that is, while it was in the granitic rock unit. The vertical axis shows “diffusivity”, which is a measure of how fast helium leaks from a material. The vertical axis is tremendously compressed, representing a factor of one trillion increases in leakage rates from bottom to top. The black numbers under the diamonds are the percentages of helium retained in each sample. The red and magenta vertical lines through the diamonds are the “two-sigma error bars”. Figure 3. Model-predicted (red and magenta diamonds) and measured (blue dots) helium leak rates of zircons. The data fit the 6,000-year prediction very well. ICR commissioned one of the world’s most respected experimenters in this field to measure the diffusivity of helium in the same-size zircons from the same borehole in the same rock formation. Using an existing mining company as an intermediary, the experimenter, being a uniformitarian (believer in long ages) and not having read ICR’s prediction allowed for a truly “blind” experiment. Figure 3 shows the experimental results as blue dots with blue “2-sigma error bars” going vertically through them. After repeated experiments over hundreds of times, the data points would remain within the caps on the error bars over 95% of the time. All data fell right on the “6000 year,” young earth prediction! The uniformitarian experimenter, whose name is in ICR’s articles, stands by their data, even though as a uniformitarian they do not like the interpretation, and even after several years, has not offered an alternative interpretation. This sequence of events places the burden of disproof on the critics, because they must explain how, if there is no truth to our model, the data “accidentally by sheer coincidence just happened by blind chance” to fall right on the predictions of our model. Critics have to explain, how the zircons suffered 1.5 billion years’ worth of nuclear decay with only 6,000 years’ worth of helium losses! Answer: ICR had checked Gentry’s values for retention with their own data on the zircons, as in CRSQ 2004. All values are accurate. Answer: This criticism was from the Critic Henke, whom derived a value for Q0, as 41 ncc/µg (1 ncc = 1 “nano-cc” = 10-9 cm3 at standard pressure and temperature, STP). He was in the right ball park, but he is probably using too small a value for the percentage of alpha particles (helium nuclei emitted by the nuclear decay) escaping the zircons. The percentage came from Gentry’s paper, but Gentry may have misstated what he meant by the number. From ICR’s measurements of lead in zircons and their rough estimate of alpha particle losses, a Q0 considerably less than 25 ncc/µg was determined. Gentry’s original calculations are no longer available, but after discussing the matter with him, ICR was inclined to believe that even if he had an error in Q0, the error canceled out when he calculated the ratio Q/Q0, which is the crucial quantity in this analysis. In support of that is the remarkable alignment of the diffusion measurements with the predictions in Figure 3. 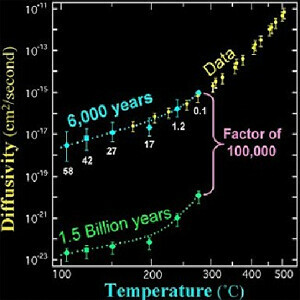 Even if Henke’s number was correct, it would reduce the percentage retentions by only a factor of two or so vs. the factor of about 100,000 reductions that Henke would need in order for it to fit the old earth belief of 1.5 Billion years (as seen in Fig.3). Answer: Sample 5 is the right-hand diamond of the predictions in Figure 3, the one at nearly 300°C with 0.1% retention. The fact that it fits the data so closely (one data point fell almost right on it) supports the interpretation. The total amount of helium in sample 6 supports the interpretation of that sample also. However, if both samples where dispensed it would still do no damage to the overall evidence. Answer: First, if the helium in the zircons were “excess” and came from outside them, it would have had to come through the biotite that is found around the crystals. The helium concentration in the biotite is two hundred times lower than the concentration in the zircon. That means, according to the laws of diffusion that the helium is presently leaking out of the zircons into the biotite, not the other way around. Also, the total amount of helium in the biotite is roughly the same as the helium lost from the zircon. Even if we assume for the sake of argument that the helium somehow gets into the zircons, the problem is it has to stay there. The magmatic fluids would raise the temperature of the zircons considerably higher than their present temperature, and temperatures would remain high for dozens of millennia. The zircons would then lose essentially all their helium, opposite of what we observe. Moreover, most of the helium outside the zircons has to disappear somehow, so that the biotite concentration would drop to its present low level, hundreds of times less than the concentrations in the zircons. Answer: ICR’s assumption of constant temperatures is generous to uniformitarians. That is because their thermal history models require a recent (by their timescale) pulse of high temperature which would wipe out all the helium in the zircons. The zircons would have to be colder than dry ice for most of their history in order to save the 1.5 billion year scenario, and no geologist would consider such a low temperature to be in the realm of possibility. The value of Q0 would make no practical difference in the results. The assumption of isotropic diffusion in biotite, showing that a more precise assumption would make no practical difference in the results. Biotite has hardly any effect on the outflow of helium from zircon, as demonstrated. 2. Henke, K. R., Young-earth creationist helium diffusion “dates”, posted March 17, 2005 at http://www.talkorigins.org/faqs/helium/zircons.html See March 17, 2005 copy archived here. 4. Vardiman, L., A. A. Snelling, and E. F. Chaffin, editors., Radioisotopes and the Age of the Earth: Results of a Young-Earth Creationist Initiative, Institute for Creation Research, El Cajon, California, and the Creation Research Society, St. Joseph, Missouri, expected publication date, on or before November 2005. 5. DeYoung, Don, Thousands not Billions, Master Books, Green Forest, Arkansas, expected publication date, on or before November 2005. 6. (ICC 2003) Humphreys, D. R., S. A. Austin, J. R. Baumgardner, and A. A. Snelling, Helium diffusion rates support accelerated nuclear decay, 2003a, in Proceedings of the Fifth International Conference on Creationism, edited by R. L. Ivey, Jr., Creation Science Fellowship, Pittsburgh, Pennsylvania, pp. 175-195, 2003. See http://www.icr.org/research/icc03/pdf/Helium_ICC_7-22-03.pdf. 7. (CRSQ 2004) Humphreys, D. R., S. A. Austin, J. R. Baumgardner, and A. A. Snelling, Helium diffusion age of 6,000 years supports accelerated nuclear decay, Creation Research Society Quarterly, 41(1), 1-16, 2004. See http://www.creationresearch.org/crsq/articles/41/41_1/Helium_lo_res.pdf. 8. Gentry, R. V., Glish, G. J., and McBay, E. H., Differential helium retention in zircons: implications for nuclear waste management, Geophysical Research Letters, 9(10), 1129-1130, 1982a. 9. Humphreys, D.R., Accelerated nuclear decay: a viable hypothesis?, in Radioisotopes and the Age of the Earth: A Young-Earth Creationist Research Initiative, edited by L. Vardiman, A. A. Snelling, and E. F. Chaffin, Chapter 7, pp. 333-379, Institute for Creation Research and the Creation Research Society, San Diego, CA, 2000. 11. For example, if the average length of zircons in that sample (number 2002) were larger than the average length in the other samples (about 60 microns), then the percentage of alpha particles retained would be higher. That would make Q0 higher than the value of 15 ncc/µg we used for the other samples, thus dropping the retention from 80.7 % to a smaller value. This affects Henke’s reasoning in item 8. 12. Stacey, F. D., Physics of the Earth, John Wiley and Sons, New York, p. 245, Table 9.3, 1969. The table says the average amount of uranium in basaltic crust is 0.8 ppm by weight. Assuming that at most an equal amount of uranium has already decayed to lead (the thorium, having a much greater half-life, would not have decayed nearly as much), and that all the helium produced thereby has remained in the basaltic magma, gives an average helium concentration of less than 80 nmol/g in such magmas. 13. Henke, K., Testimony to the failure of fundamentalism, posted December 31, 2001, http://www.amazon.com/gp/cdp/member-reviews/AKAJJROZZM9M4/103-0783137-0663064?_encoding=UTF8. 15. Humphreys, D. R., Beyond Neptune: Voyager II supports creation, ICR Impact, No. 203, May 1990, archived at http://www.icr.org/pubs/imp/imp-203.htm. 16. Helium Evidence for a Young World Remains Crystal Clear, and Helium Evidence for A Young World Overcomes Pressure, by D. Russell Humphreys, Ph.D.
D. Russell Humphreys, Ph.D. Institute for Creation Research, April 27, 2005, Copyright © 2005. All Rights Reserved.